This morning, the Tuesday Seniors group hosted The Blind History Lady, a.k.a. Peggy Chong. 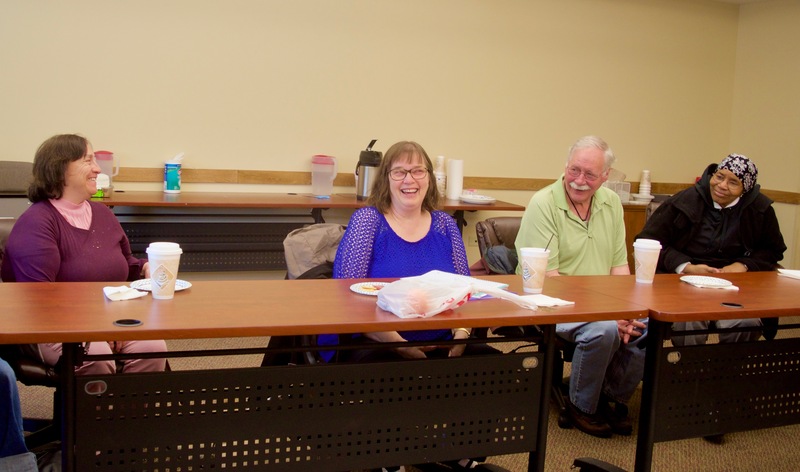 Chong, a long-time member of the National Federation of the Blind, recently retired to Aurora from New Mexico with her husband, Curtis. For a number of years she has researched stories and records of blind Americans, some as far back as the 19th Century, in order to bring their more or less forgotten or never-known lives to light. Her “blind ancestors” as she considers them to be, become more fully rounded-out citizens, and not just Hollywood stereotypes as she tells their stories in person or in print. Having researched archives and records about blind people in the many states where she and Curtis have lived (New Mexico, Iowa, Minnesota, Maryland), Peggy is currently searching for blind Coloradans from the past. In fact, she spent the better part of the afternoon looking through old records here at the center, some dating back as far as the 1920s. Yes, our Colorado blind ancestors!